You may already know all the myths about the quality of remanufactured printer cartridges versus original equipment manufacturer (OEM) ink cartridges. But let’s dig a little deeper on some of the misunderstandings surrounding how these cartridges are actually produced. OEM ink cartridges are manufactured by the same company that makes your printer. For example, if you have an HP printer, then the OEM cartridge would originate from HP as well. For inkjet printers, the cartridge contains one or more ink reservoirs. Laser printers use toner cartridges with powder, which is a fine, dry mixture of plastic particles, carbon, and coloring agents that make the image on the paper. The toner transfers to the paper via an electrostatically charged drum unit and fuses onto the paper by heated rollers during the printing process. Think of a remanufactured cartridge as a refurbished OEM cartridge. It begins as a new OEM cartridge. After the ink is finished, the cartridge shell is still usable so why throw it away? Instead, a manufacturer can disassemble, inspect, clean, and test the shell. The manufacturer then replaces any damaged parts and refills the ink. Most remanufactured cartridges meet or exceed OEM standards. The process of overhauling the cartridge and using new ink yields just as high-quality results as an OEM cartridge. 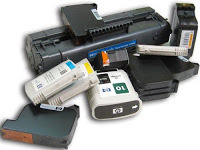 Remanufactured cartridges are also much more environmentally friendly since the old cartridges don’t go to a landfill. A cartridge takes 450 to 1,000 years to decompose in a landfill. Not to mention that remanufactured cartridges tend to be quite a bit cheaper than OEM choices—often saving you 50 to 75% on ink costs. So will you give remanufactured printer cartridges a try now that you know a little bit more about them? Let us know below or on Facebook and Twitter.